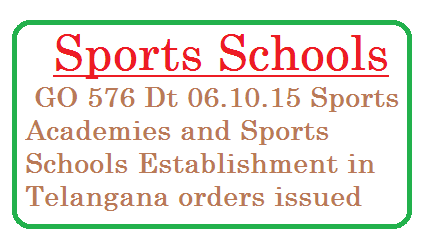 Telangana Sports Academy | Telangana State Sports Schools | Youth Services and Sports Departments – Establishment of New Sports Academies / Sports Schools in the State with an estimated cost of Rs.1,73,00,000/- Administrative Sanction - Accorded - Orders – Issued. 2. After careful examination of the proposal Government hereby accord administrative sanction to the Vice Chairman and Managing Director Sports Authority of Telangana State for an amount of Rs.1,73,00,000/- (Rupees One Crore and Seventy three lakhs only) to establish the above New Academies/Sport School in the State. 3. The expenditure sanctioned in para-2 above shall be met within the Budget Allocation provided by the Government under Planned Grant to the Sports Authority of Telangana State in B.E. 2015-2016. 4. The Vice Chairman and Managing Director Sports Authority of Telangana State shall take necessary action accordingly.